PURPOSE AND EFFECT: The purpose and effect of this rule is to implement provisions of Article X, Section 29 of the Florida Constitution, to set out clear guidance on use of terms and implementation of the amendment which went into effect on January 3, 2017. SUBJECT AREA TO BE ADDRESSED: The use of medical marijuana for debilitating medical conditions. RULEMAKING AUTHORITY: Art. X, § 29(d), Fla. Const. LAW IMPLEMENTED: Art. X, § 29, Fla. Const., 381.986 FS. February 6, 2017, 2:00 p.m. – 4:00 p.m.
February 8, 2017, 9:00 a.m. – 11:00 a.m.
February 8, 2017, 6:00 p.m. – 8:00 p.m.
February 9, 2017, 4:00 p,m, – 6:00 p.m.
Pursuant to the provisions of the Americans with Disabilities Act, any person requiring special accommodations to participate in this workshop/meeting is asked to advise the agency at least 5 days before the workshop/meeting by contacting: Courtney Coppola at Courtney.Coppola@flhealth.gov. If you are hearing or speech impaired, please contact the agency using the Florida Relay Service, 1(800)955-8771 (TDD) or 1(800)955-8770 (Voice). 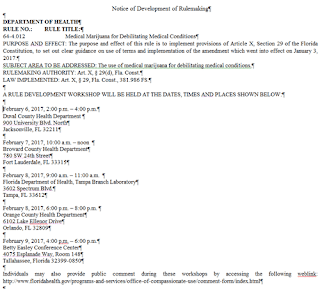 THE PERSON TO BE CONTACTED REGARDING THE PROPOSED RULE DEVELOPMENT AND A COPY OF THE PRELIMINARY DRAFT, IF AVAILABLE, IS: Courtney Coppola at Courtney.Coppola@flhealth.gov. 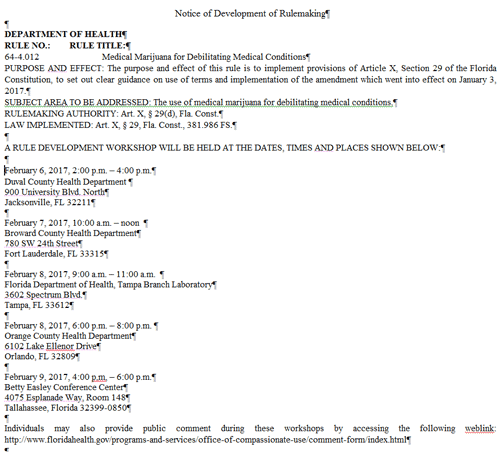 (a) “Medical Marijuana Treatment Center (MMTC)” shall have the same definition as a dispensing organization in s. 381.986(1)(b), F.S. (b) “Caregiver” shall mean a legal representative as defined by s. 381.986(1)(d), F.S., who is at least twenty-one (21) years old and has successfully passed a Level 1 background screening as defined in s. 435.03, F.S. (c) “Medical use” shall have the same definition as medical use in s. 381.986(1)(g), F.S. (d) “Qualifying patient” shall mean a qualified patient as defined by s. 381.986(1)(h), F.S., who has been diagnosed to have a qualifying debilitating medical condition, has a physician certification, and who has a valid patient Compassionate Use Registry identification card. (e) “Qualifying debilitating medical condition” shall mean conditions eligible for physician ordering contained in s. 381.986(2), F.S., or cancer, epilepsy, glaucoma, positive status for human immunodeficiency virus (HIV), acquired immune deficiency syndrome (AIDS), post-traumatic stress disorder (PTSD), amyotrophic lateral sclerosis (ALS), Crohn's disease, Parkinson's disease, multiple sclerosis. Also, any debilitating medical conditions of the same kind or class as or comparable to those enumerated, as determined by the Florida Board of Medicine. (f) The 45 day supply limitation set forth in s. 381.968(2)(e), F.S. shall be an adequate supply for a qualifying patient’s medical use. (g) A physician authorized to order medical marijuana means a qualified ordering physician who has met the requirements of s. 381.986 (2-4), F.S. (h) “Physician certification” means DH8011-OCU-12/2016, “Physician Certification,” which is incorporated by reference and available at http://www.flrules.org/Gateway/reference.asp?No=Ref-#### and must be submitted with each “Compassionate Use Registry Identification Card Qualified Patient Application.” A physician certification may only be provided after the physician has conducted a physical examination and a full assessment of the medical history of the patient. In order for a physician certification to be issued to a minor, a parent or legal guardian of the minor must consent in writing. (2) All MMTCs, physicians, patients, and caregivers must be registered in the online Compassionate Use Registry as required by s. 381.986(5)(a), F.S., and Rule 64-4.009, F.A.C. All orders for medical marijuana must be entered into the registry for processing accordingly. (3) The process for registering as an MMTC shall be the same approval and selection process outlined in s. 381.986, F.S., and Rule 64-4.002, F.A.C., and subject to the same limitations and operational requirements contained therein. (4) All MMTCs shall follow the medical record keeping standards as set forth in Rule 64B8-9.003, F.A.C., as adopted and incorporated herein. (5) All MMTCs shall abide by the security, product testing, labeling, inspection and safety standards set forth in s. 381.986, F.S and this chapter. Rulemaking Authority Art. X, § 29(d), Fla. Const. Law Implemented Art. X, § 29, Fla. Const., 381.986 FS. History – New ­­­­______­­­.